Can you guess the most popular category on Pinterest? It’s Food & Drink, duh. Everyone from your grandma to your 12-year-old nephew is pinning recipes for red velvet cake, avocado toast and cheesy chicken enchiladas. The social-media site — which collects data from its 150 million users — recently put together a board called The Foodnited States that highlights the most popular foods on Pinterest in each state. 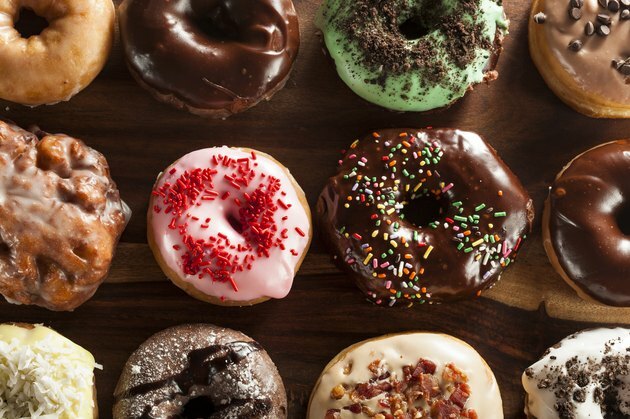 Vice Munchies created a handy map using the data that shows what Pinterest users across the country are hungry for, from Thai chicken in Washington to doughnuts in Maine. Many states’ food obsessions make total sense. For example, Louisiana is known for its succulent Gulf shrimp, and shrimp pasta is its most pinned dish. And Alaska’s overindexing food interest, survival bread (a long-lasting foodstuff eaten by survivalists, hikers and campers), speaks to the state’s outdoorsy culture and remote landscape. Read on to find out which states are obsessed with the healthiest — and least healthy — foods. What are the states with the least healthy food interests? We’ll have to give that designation to Kentucky and Ohio. The two Midwestern states can’t stop pinning peanut butter fudge and peanut butter brownies — desserts that are packed with sugar and fat. Meanwhile, South Dakota likes its greasy, deep-fried tater tots, Arkansas is obsessed with sugary Coca-Cola and Alabama prefers butter-packed pound cake. Nebraska’s sandwich of choice, sloppy Joes, is typically high in fat and sodium, unless it’s made with lean beef and homemade seasoning. And then there’s Maine, a state with a fetish for sugar-filled, deep-fried doughnuts, and North Carolina, which likes high-calorie, high-fat banana pudding. It’s worth noting that the majority of these states are located in the South, which is the region with the highest rate of obesity in America. And the states with the healthiest food obsessions? Californians pin recipes that incorporate fiber-rich figs; Massachusetts residents are obsessed with vitamin A-packed butternut squash; Minnesotans can’t get enough broccoli salad, a dish rich in fiber, iron and potassium; North Dakota residents are big fans of oatmeal bars, which help lower bad cholesterol; Vermont’s population loves nutrient- and fiber-rich beets; Virginians are obsessed with fruit-filled smoothie bowls; and Hawaiians love matcha green tea, a refreshing beverage that’s loaded with immunity-boosting antioxidants. For a full list of the most popular foods on Pinterest in each U.S. state, check out the list below. Does your state’s most-pinned food surprise you? Do you use Pinterest to get food and recipe inspiration? Can You Guess the Most Popular Recipe In Your State?